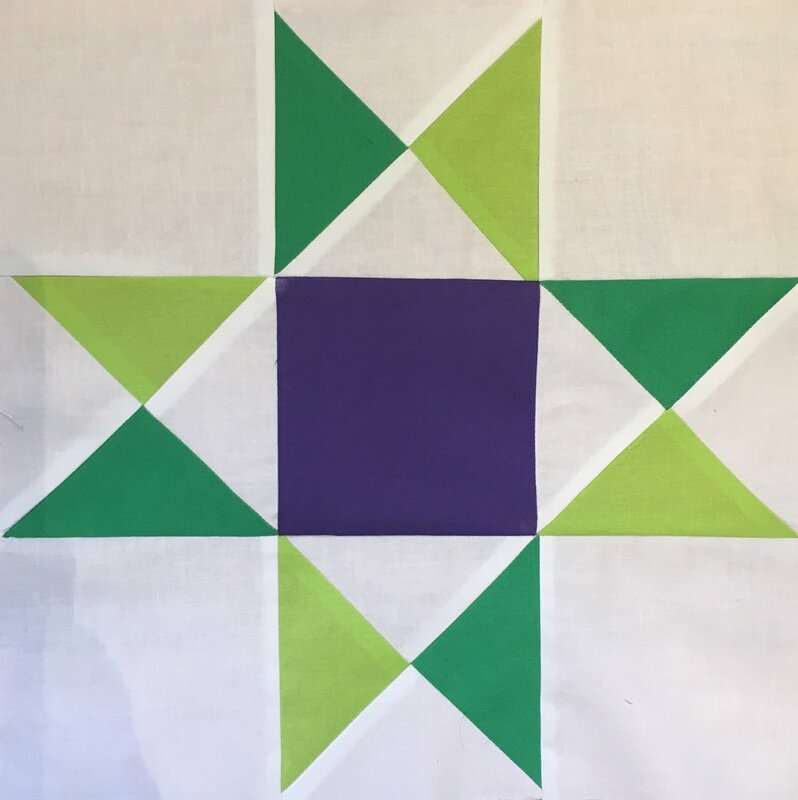 As a member of Proper Bostonian Quilters Guild, I've been participating in a year long Mystery Quilt project designed by one of our members. Each month we were given either 2 star blockspiece or connecting blocks to piece. A color palette wasn't specified so everyone's blocks look very different. One friend is making a yellow baby-themed quilt and is using all low volume fabrics. It's fun to see everyone's choices. Above are 6 of the 9 stars in the sampler. The pattern called for 8 inch finished block but wanting a larger quilt, I increased the block size to 12 inches unfinished. Enlarging the patterns was a good exercise in quilt math--it actually turned out to be a lot easier than I'd expected! 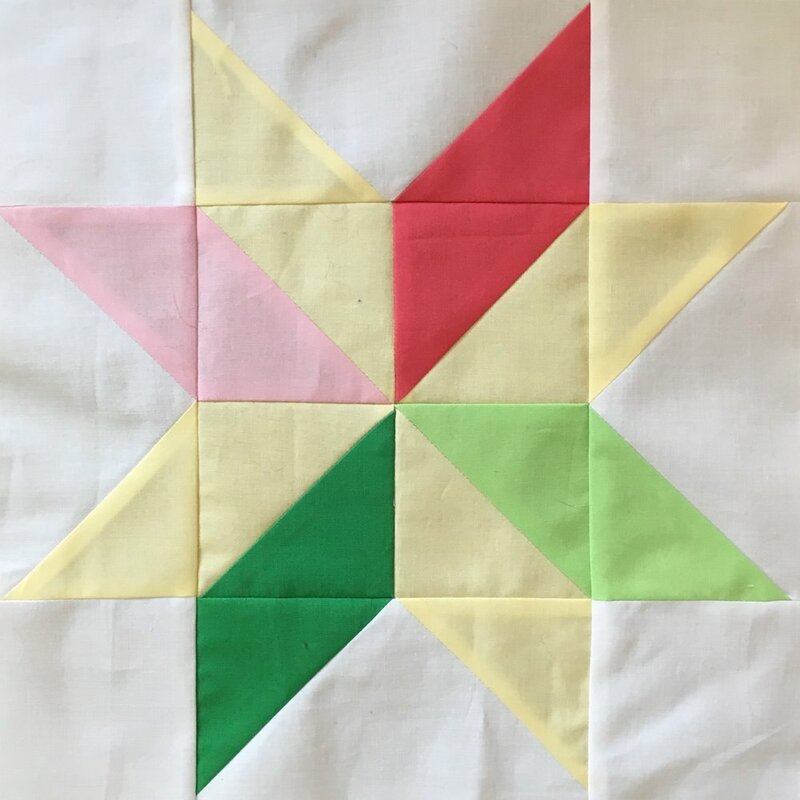 I decided to just make the star sampler blocks and assemble them without using the Mystery Quilt's connecting blocks. I've definitely gone off-track with this project! The completed quilt (or just the completed quilt top) is due next week, at our last Spring meeting. I'll post my completed quilt after the "Big Reveal" at guild! Thanksgiving is over, so that means that it's time for Bonnie Hunter's annual Winter Mystery Quilt. This year she has named her quilt "Grand Illusions", and has is using a color scheme inspired by the decor of the Grand Hotel on Mackinac Island, MI. Bonnie has picked warm yellow, hot pink, turquoise, grass green, black and neutrals for this quilt. (Click the link to Bonnie Hunter's Quiltville.com blog to see the Mystery Quilt steps). I really enjoy making Bonnie's Winter Mystery Quilt. Each of the steps is very manageable but the end result is always a quilt that is so complex that I would never make it if I saw the design before I started sewing! The other great thing about Bonnie's quilts is that they use up quantities of scraps! The more varied the scraps, the more exciting the quilt. My rule this year--all the fabric has to come out of my scrap bins or stash. After trolling my fabrics I found that the scraps in my bins don't correlate well with the colors Bonnie has recommended. I will need to use a different color way. Last year, making Bonnie's Celtic Solstice Winter Mystery Quilt, I swapped out the orange in her design for hot pink so there is little hot pink in my scrap/stash. And I rarely use blacks, so that bin wasn't looking very promising either. I'm keeping her grass green and turquoise. I know my quilt won't have the strong color contrasts as a quilt made with the colors Bonnie picked, but I'm hoping my white will give enough contrast to keep it interesting. As I was ironing and starching my scraps in preparation for cutting, I found a lovely strip of aqua fabric which was 2.5 inches wide. I found myself ironing, and ironing and ironing...the strip seemed to have no end. Then it dawned on me. This "scrap" was a binding that I had started to make and then decided not to use. But it will perfect for this quilt. So I finished ironing it, folding it in half and pressed it in half the long way. The quilt's binding was made, before I'd cut a single block! That was a first!! I laughed when I saw Step 1. The weekend after Thanksgiving, the block we are making is "Broken Dishes." 100 of them! I thought that was amusing! But with the blocks finishing at 4 inches square, that's probably more like Tapas plates than Thanksgiving platters! Here's what I did this weekend. Step 2 Coming Friday! Happy sewing fellow Bonnie Hunter Mystery Quilt fans! Here's link to Bonnie Hunter's "Grand Illusion" Step 1 Link-up. Check it out to see what other folks have done so far.